There have been dozens of restaurant openings in DC lately. One of the buzziest is Le Diplomate, the Logan Circle French bistro from Philadelphia restaurateur Stephen Starr. It has been the subject of countless reviews, tweets, and actual conversations. I recently spent three days eating around Paris, yet I can’t stop thinking about the food I dispatched before takeoff: at the new Le Diplomate in Logan Circle. In significant ways, the sweeping brasserie from Philadelphia restaurateur Stephen Starr speaks with a more convincing French accent than much of what I encountered abroad. Le Diplomate’s buzz is not restricted to noise about the restaurant. It’s very loud inside as well. We begin our meal with a cheese plate, but I have no idea what three cheeses we are served, even though I ask more than once. I hear something about goat cheese, sheeps cheese, and washed rind cows cheese. Oh mon dieu! (I took French in high school). The cows cheese is pungent and bitter, and all I can think of is stinky feet. My husband loves it, while our dining companions Cousins A and B aren’t convinced either. We don’t have to sulk over the stinky cheese. The bread basket captures our attention like no cheese ever will. Crispy crust? Check. Light and chewy on the inside? Check. Bread lovers beware. It is tempting to devour every bite. Don’t do it. 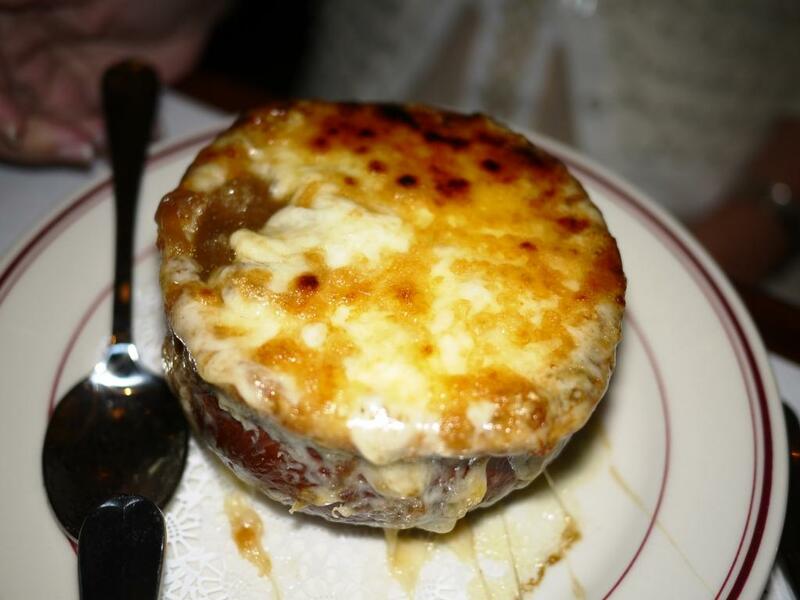 Cousin A orders onion soup gratinee, and while I’m desperately trying to save room for a big hunk of steak, I am grateful for a few spoonfuls. It’s perfection in a bowl. The rich broth is laced through with onions, but my heart belongs to the thick crusty cheese oozing off the side of the bowl. Ooh, la la. 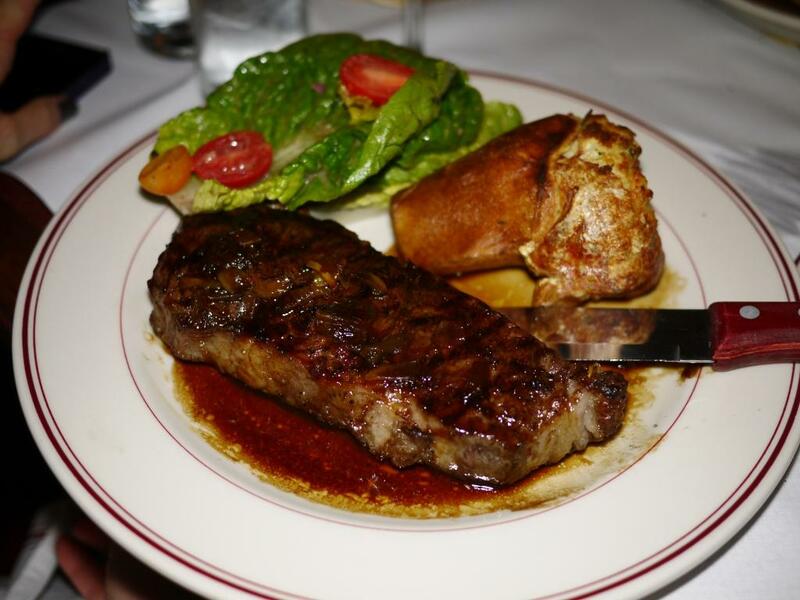 My entree is a Saturday special- entrecôte de boeuf accompanied by a simple salad and a popover, for $38. I think it’s a reasonable deal, considering it is a hefty piece of meat and includes accompaniments. The popover doesn’t blow me away, but the meat is tender and juicy. I can’t wait to enjoy the leftovers when I’m feeling less full. 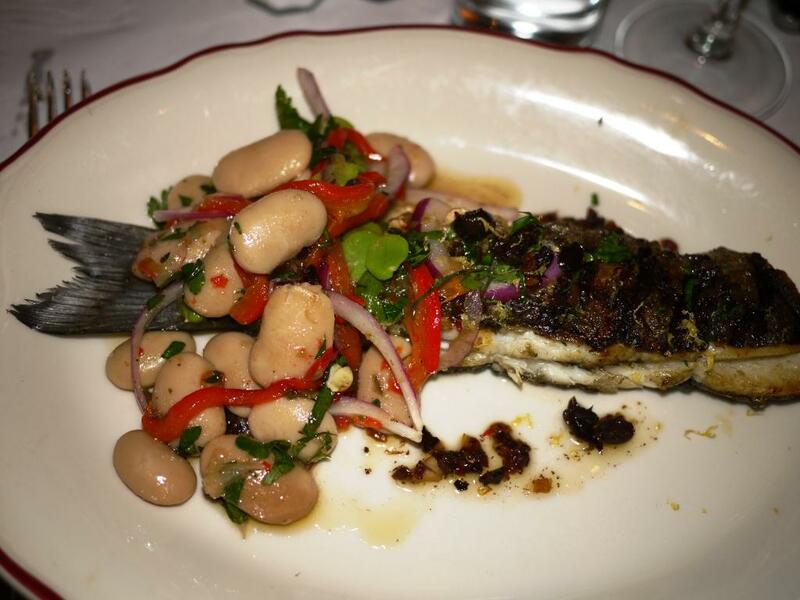 Grilled loup de mer with tapenade, roasted peppers, and gigante beans is plated beautifully and playfully. The flavors live up to their promise. 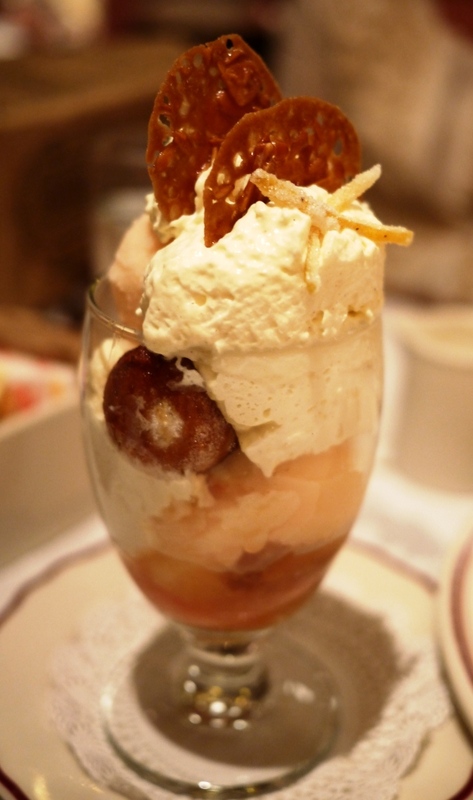 I want something refreshing for dessert and grapefruit coupe glacee with candied grapefruit and cinnamon whipped cream hits the spot. I hope no one notices that I took more than my fair share of candied grapefruit. Friends express surprise when their efforts to secure reservations at Le Diplomate have been unsuccessful. I puzzle over anyone thinking it will be easy to get in with just a few days notice. Le Diplomate is definitely a plan ahead kind of place. I find Le Diplomate to be très magnifique. My one caveat is about the noise. It is part of the ambiance (which my son describes as “incredible”), and the inescapable result of the restaurant’s success. As I always say, if you can’t take the buzz, stay out of the kitchen. But if you do, you’ll be missing out on a buzzworthy experience.